Tyrone Davis tallied 33 points to lead the Schenck Wolverines’ to a 69-52 victory over Easton in the Class D North quarterfinal at the Cross Insurance Center Monday afternoon. BANGOR, Maine — Tyrone Davis missed the final two games of the regular season after rolling an ankle and after staying off it for two weeks, his coach Darrick Thompson said Davis was just starting to feel healthy three days ago. 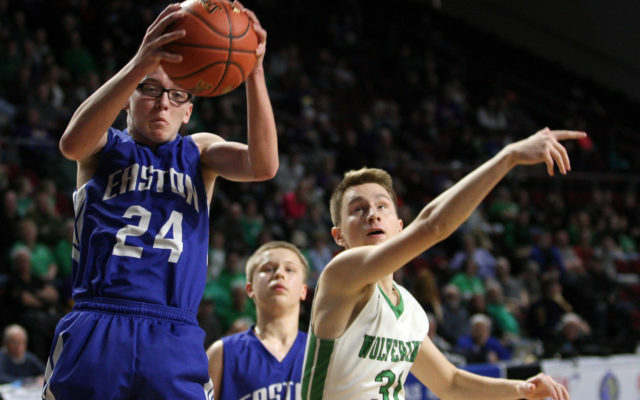 The Schenck 6-2 sophomore appeared to enjoy a clean bill of health Monday afternoon at the Cross Insurance Center as he tallied 33 points in the Wolverines’ 69-52 victory over Easton in the Class D North quarterfinal at the Cross Insurance Center. Davis was getting open inside, which is his usual game, but he also stepped back for some midrange jumpers and a few 3-pointers to contribute to the lofty scoring numbers. He was 9 for 13 in the first half, staking Schenck to a 40-22 lead with his 21-point performance, and for good measure nailed 4 of his 6 attempts in the second half. As a team, the Wolverines connected on 15 of 24 shots from the field before intermission. They cooled down a bit in the second half and went 8 for 21, but still finished at over 50 percent in the game. They also hit 9 of their first 10 attempts from the foul line. “They came out shooting the lights out and everything they were throwing up was going in,” said Easton coach Cody Closson, whose initial strategy was to shut down Schenck’s other top scoring threat, senior Travis Thompson, by employing a box-and-one defense. When Davis hit 6 of his first 8 tries from the field, Closson changed his plans and went to a zone, but it was too late. Easton never led, but stayed close in the first quarter by taking advantage of some turnovers and using an Austin Carver basket with 1:10 left in the opening period to trail by only three (13-10), but the Wolverines’ 12-2 run over 2-1/2 minutes, which included seven points by Davis, stretched it out and the Bears failed to get to within 12 the rest of the way. Eleven other Schenck players scored in the game, with nobody getting more than seven. The Wolverines, the No. 4 seed, will now play Woodland in Thursday’s semifinal at 3:35 p.m. Thursday. The Bears were led offensively by senior guard Isaac Currier, who tallied 13 points. Camden Michaud and Matt Pangburn added nine points each and Austin Carver chipped in with eight. The No. 5 seeded Bears ended up with an 11-8 record.